Sold by Amazing_Buy (4.8 out of 5 | 10,733 ratings) and Fulfilled by Amazon. Gift-wrap available. Jallianwala Bagh. 13 April 1919. Twenty-two-year-old Nanak Singh joins the mass of peaceful protestors agitating against the Rowlatt Act. 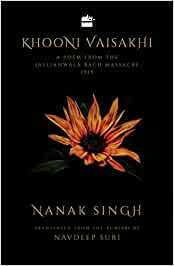 What then turns out to be one of the worst atrocities perpetrated by the British Raj, and a turning point in India's independence movement, also becomes a life-changing experience for Nanak Singh, who survives the massacre, unconscious and unnoticed among the hundreds of corpses. After going through the traumatic experience, Nanak Singh proceeds to write Khooni Vaisakhi, a long poem in Punjabi. The poem was a scathing critique of the British Raj and was banned soon after its publication in May 1920. After sixty long years, it was rediscovered and has been translated into English for the first time by the author's grandson, Navdeep Suri. Featuring the poem in translation and in original, this bilingual book is accompanied by essays from Navdeep Suri, Punjabi literature scholar H.S. Bhatia and BBC correspondent Justin Rowlatt. Khooni Vaisakhi is not only a poignant piece of protest literature but also a historical artefact and a resurrected witness to how Sikhs, Hindus and Muslims came together to stand up to colonization and oppression in one of India's darkest moments. Sold by aMuse and ships from Amazon Fulfillment. NANAK SINGH (1897-1971) is widely regarded as the father of the Punjabi novel. Hewrote an astounding fifty-nine books and received the Sahitya Akademi Award in 1962. NAVDEEP SURI joined the Indian Foreign Service in 1983 and is currently Ambassador to UAE. He has translated into English his grandfather Nanak Singh's classic Punjabi novels Pavitra Paapi and Adh Khidya Phul. Start reading Khooni Vaisakhi on your Kindle in under a minute.